Queensland Police Senior Sergeant Mick Isles signed on duty on the morning of Wednesday 23 September 2009, went to work in uniform and has never signed off. We are awaiting response from Queensland Police Commissioner Ian Stewart to adding Senior Sergeant Mick Isles to the Police Honours Roll and officially acknowledging his (Mick’s) signing off. How can that be unreasonable? A trait of my father’s, an honourable trait through his commitment, belief and passion in people was more-or-less to always look for the good in people, even when I was a child and assaulted by an adult, my father convinced me to look for the good in the assailant, as there was obviously greater reason to why he was like that, an upbringing or similar. I found myself doing precisely that eventually, after the anger had moved on, I looked to for the good in this individual and many years later made peace in speaking with him and seeing that he had grown and changed and was no longer the same person. As life has progressed even with some of the trials, especially more recently, I have found myself retreating a little over the last couple of years and trying to remove myself from stressful situations. I guess, now I am finding there needs to be some happy medium and in an ideal world, my father’s trait would be admirable however in a world where many through generations have strayed from strong morals and treating your neighbour as you, yourself, would like to be treated. For me both physically and mentally, I have softened over recent years in my zest, interest and drive for life. This in part has seen me too readily trust in individuals and some have resulted in individuals using the apparent lack of energy and zest as an avenue to access a perceived vulnerability and to take advantage. For mine, in approaching 2017, simply applying much of life experience and the honourable person my father was, I can only aim to regain touch with the inner mongrel I had to find to navigate some of the situations that were thrown my and my family’s way. This coming year, in order the finalize some matters close to my heart that have come so far, I will dance with the devil while maintaining strong morals however only extend a hand of trust, respect or offer of friendship where it is over time earned. May those close and many that have shared some of this journey with me be able to toast achievements even beyond boundaries that have been set by individuals and bureaucracy. A couple who spotted a ‘weather beaten man’ at a remote creek in northern Queensland have contacted police saying they believe he may be missing Senior Sergeant Mick Isles, who disappeared in mysterious circumstances five years ago. Graziers, Bill and Elizabeth Tudehope were on a remote road at Landers Creek on the Burdekin River near Millaroo last Sunday when they saw the man who was of the same age and height as the missing police officer, the Townsville Bulletin reported. 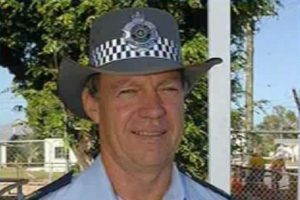 Sgt Isles has not been seen since September 23, 2009 after leaving his home in the far northern Queensland town of Ayr for a workshop 80km north in Townsville. He never arrived. Six days later, his police issue Toyota Aurion was found at Eight Mile Creek, 170km south. The latest sighting of Sgt Isles is at a location between Ayr and Eight Mile Creek. Following his disappearance, police conducted extensive searches for the 58-year-old, using trackers, the stock squad and the State Emergency Service. Apart from one alleged sighting by a truck driver soon after his disappearance, Sgt Isles has never been seen again until now. At the time of his disappearance, Sgt Isles was on only his third day back at work after a lengthy period of sick leave following a Crime and Misconduct Commission investigation which had exonerated him of drug trafficking and money laundering allegations. His wife, Fiona, reported her husband’s failure to return home after finding an undated note on the last page of a used notebook. The note read, ‘This is nobody’s fault but mine. I feel old and have lost the will to do anything. I feel a failure and a loser, particularly to my family whom I love so much’. The note was signed ‘Mick + Dad’. A shot gun and ammunition were found to be missing from the Isle’s family home. Officers found a police uniform shirt stuffed under the front passenger seat of Sgt isles’ abandoned car and in the boot, along with a hessian bag, was a blanket and a box of ammunition that was missing 16 cartridges, a pair of uniform pants and a belt. The car keys were on the front driver’s side floor of the vehicle and a set of senior sergeant epaulettes had been placed in the centre drink console. At a 2012 inquest, Queensland State Coroner Michael Barnes found Senior Sergeant Michael Isles ‘intentionally took his own life‘ on the day he was reported missing. Mr Barnes said: ‘I sincerely regret the distress this will cause his family’. The Townsville Bulletin reported that on Monday northern Queensland police have sent a team of detectives to the Burdekin river area to interview the couple who made the report. Mr and Mrs Tudehope said they saw a man walking along a sugar cane train track mid-morning last Sunday and they asked him if he wanted a lift. ‘He wasn’t interested in talking to me and didn’t want any help,’ Mr Tudehope said. They contacted Sgt isles son Steven, who travelled to the couples’ property and then contacted police. THE life of former Warwick and Allora police officer Mick Isles will be remembered at a special memorial service to be held in north Queensland next weekend, his family has announced. Senior Sergeant Isles – who has been missing since September 2009 – was a popular figure in the region during his service here, which ended in 1989. Mystery still surrounds his disappearance and his family suspect foul play, but the Queensland Coroner last month issued an interim death certificate ahead of an inquest set down for next March. Snr Sgt Isles (pictured) was on duty and driving from Ayr to Townsville for training when he vanished, but his family still hold out hope his remains at least will be found, if not the people they believe may be responsible for his death. Son Steven Isles yesterday released details of the memorial service to the Daily News, saying he and his mother and sisters had been deeply moved by the support they had received from locals who remembered their beloved Mick. “We still think at times that by some magic he might walk through the door tomorrow,” an emotional Steven said. Mr Isles said the death certificate meant his mother, Fiona, could finalise matters relating to the estate after being forced lean on her children for financial support. The Isles family has been critical of the hierarchy of Queensland Police, which they say failed to fully investigate Mick’s disappearance and repeatedly gave them the cold shoulder and little respect. Snr Sgt Isles was police officer-in-charge at Ayr and was reported missing on October 2, 2009. Five days later his police-issued Toyota Aurion was found on a rough track near Ravenswood, 120km southwest of Townsville. Steven Isles believes that people involved in his disappearance drove the vehicle there as a diversion. Snr Sgt Isles had been cleared of corruption allegations the previous July and had been struggling to deal with the aftermath, but Steven Isles said his father had shown no signs of being suicidal in the days before his disappearance. The memorial service will be held at the Burdekin PCYC in Ayr on November 5, at 10.30am. Part of the new Ayr PCYC building has been named after missing officer Mick Isles. His wife Fiona Isles says the dedication is an honour but feels the family have been let down by the QPS. The family of missing Burdekin police officer Mick Isles has spoken out at the opening of a new PCYC facility in Ayr today. The PCYC’s function room has been named after the Senior Sergeant who disappeared in September 2009. Mick Isles’ wife Fiona feels proud that the work of her husband has been recognised by the community and believes he would have been humbled by the honour. “Mick would be very proud in fact he’s such a humble person he’d be standing there saying ‘there must be someone more deserving than me’ he’d be that sort of guy”. Senior Sergeant Isles was last seen driving an unmarked police car, his clothes and the vehicle were later found at a property in Ravenswood, south of Townsville. Looking back on the past 18 months Mrs Isles feels she was let down by the police service and says the family was not offered any help or counselling until her son insisted they provide it. “It was rather pathetic They did do it only because he forced their hand. My family weren’t offered any sort of counselling, my daughters whatever, they had to go looking for their own”. Eighteen months on the family of Senior Sergeant Isles remain hopeful that he will be found. “Our family would never give up hope. We keep looking we keep looking, I keep going out to the spot where he disappeared and hope there’s something that may materialise” says Mrs Isles. A pre-inquest hearing into the case will be held later this year. A SEARCH by police of rugged bushland where missing policeman Senior Sergeant Mick Isles‘ abandoned car was found has failed to find any trace of the man last seen alive on September 23 last year. Police wound up the two-day search around noon yesterday. A police spokesperson said the search focused on an area about two kilometres out from where Sen-Sgt Isles‘ unbadged, police-issued Toyota Aurion was found at the end of a little-used bush track at a spot called Eight Mile Creek on Hillsborough Station. This week’s search involved police cadets, veteran officers and the horseback mounted stock investigation squad from Charters Towers. A police spokesperson said the search for Sen-Sgt Isles would be ongoing. “The QPS will never stop looking for Sen-Sgt Isles. The QPS is also helping the coroner with his investigation. As this investigation is ongoing, further searches may be conducted in the future,” she said. The spokeswoman said the Forward Commander for the search was assisted by 10 police officers from general duties and specialist areas, and 28 police recruits from the North Queensland Academy. The two-day search was conducted in hot and trying conditions. One police officer told the Townsville Bulletin that conditions for recruits and officers walking the hilly countryside on foot were extremely hot. “They’ll be pretty knocked up,” she said. “This was a routine search which had originally been planned for July. “We had some rain back then and it threw things out a bit, so we’re here now seeing if we can find anything,” she said. Sen-Sgt Isles‘ car was found at Hillsborough Station on September 28, five days after he was last seen alive. Nothing has been heard of him since. A sacked Northern Territory cop has launched action against two police forces, claiming he’s been victimised since the apparent suicide of his father. Steven Isles, a constable with NT police since 2003, has lodged an unfair dismissal claim with Fair Work Australia over his sacking by NT Police Commissioner John McRoberts in July. Mr Isles was on sick leave for almost three years before his dismissal following a dispute with superiors over police procedures. However, he said he was ready and willing to come back to work in 2008 but NT police refused a request to institute a return-to-work program, similar to those offered in other jurisdictions, to support him during the transition. 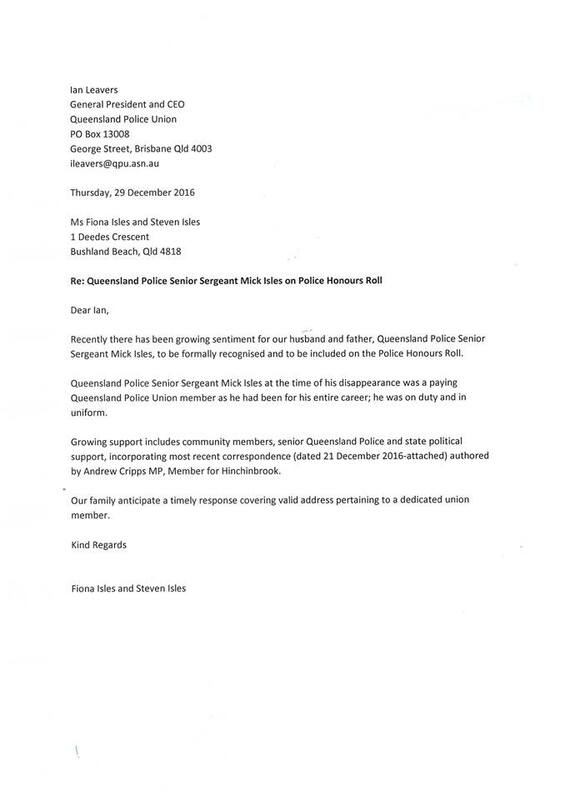 Mr Isles has also made a formal complaint to Queensland’s Crime and Misconduct Commission, alleging he’s been targeted and slandered by senior police since speaking out over the treatment of his father, Senior Sergeant Mick Isles, who disappeared in north Queensland last September. He alleges senior officers in Queensland and the NT colluded to discredit him in both jurisdictions in order to pave the way for his dismissal. This included officers making unsubstantiated claims he was suffering from a mental illness and spreading rumours of his involvement in his father’s death, he alleges. “I personally have been victimised and targeted and the subject of slanderous action taken by senior staff and personnel,” Steven Isles told AAP. A CMC spokeswoman confirmed a complaint had been received on August 31 and was currently under assessment. Both NT and Queensland police declined to comment on the matters. 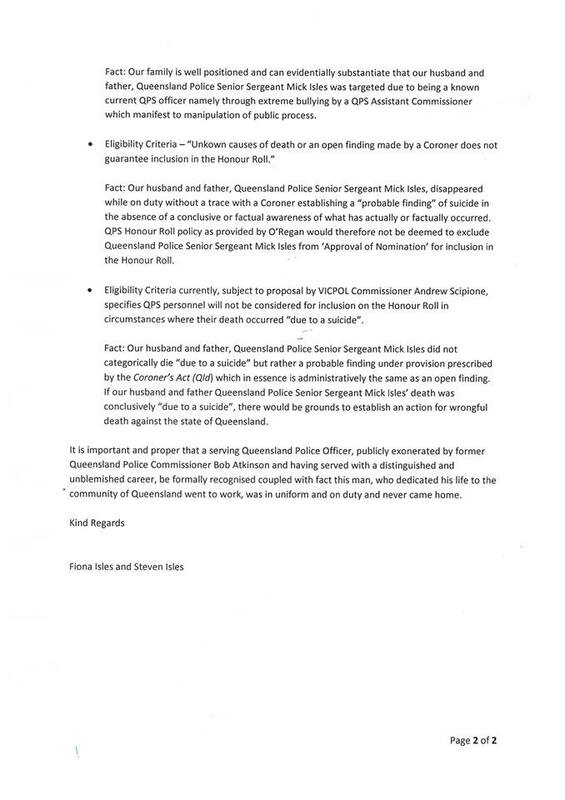 Sen Sgt Isles went missing three days after returning to work at Ayr police station, south of Townsville, following a year-long absence while he was under investigation over allegations of corruption. His vehicle was found abandoned in bushland west of Townsville but his body has not been located and Queensland’s coroner is investigating the apparent suicide. Steven Isles has been critical of his father’s treatment, including the length of time it took to clear him of the allegations and the lack of support from within QPS. He claims senior police responded to his stand by spreading rumours and false allegations about him. In March this year the QPS notified Mr Isles his weapons licence would be revoked after several officers filed affidavits stating they believed he was suffering from a mental illness and that he’d made threats to knee-cap Police Commissioner Bob Atkinson. The loss of the weapons licence would have been grounds for his dismissal in the NT. However, Queensland’s Civil and Administrative Tribunal last month reinstated the licence after police were unable to produce sufficient evidence to support the claims. Mr Isles then voluntarily surrendered his weapons licence. The Workers Compensation Act of 1987 and 1998 clearly states that an action by an employer that is unreasonable is an offence. An Investigation that is dragged out for three years is clearly unreasonable when they are supposed to be completed in 90 days. The Ombudsman can give an extension, but it also must be reasonable. Murders are usually solved within three months. If any of us as investigators take too long to complete a matter, then we face serious managerial actions so why not the investigators of internal matters? Has there ever been a 173 or 181 issued to an investigator of an internal matter that has failed or not been successful? I’ll bet not, but then again old Reg has been wrong before. Fact is allegations can hurt a person, but more so hurt a good honest hard working officer because of the pride that comes with sound integrity. To be put through such an ordeal for such a long period with such a minor and disproportionate outcome, is plain disgusting and I hope in the end an enquiry into the matter of the good Sergeant reveals this. This sort of delay in an internal investigation, also does damage to the family unit, especially the wife who like for most of us has to endure watching their husbands become withdrawn and gutted even after the allegations are proven untrue. It would be an interesting read for those of you without an investigators background and I recommend it to anyone with a genuine interest in this matter. For those of you not bothered to read the report here is the full wording of the conclusion, on page 29 of the report. My review of the actions and holdings of the CMC in relation to the investigation of Sen Sgt Isles revealed that, in regards to the concerns raised by Mr Steven Isles, Senior Sergeant Michael Isles and Mr Terry O’Gorman, the investigation was conducted appropriately but not in a timely manner. QPS officers at the Ayr Police Station. The CMC ascertained that four of the principal target’s associates had obtained HR licence upgrades in the relatively recent past and that those tests had been conducted and the four licences upgraded by Sen Sgt Isles. The CMC considered that comments made by the principal target suggested that the person of interest may have been involved as the conduit for the communication and flow of funds and information between the principal target and the subject police officer. Telephone billing and call charge records established a high frequency of telephone contact between the person of interest and Snr Sgt Isles and a fair amount of contact between the person of interest and the principal target. I do not consider the CMC’s actions in seeking search warrants based upon this information, to be inappropriate. In my view the CMC did consider all relevant and available facts and materials before seeking the search warrants from the Magistrate. Certain matters which might be regarded as adverse to the issuing of the warrants sought were disclosed in the applications for the search warrants. Other matters were not disclosed in the applications for the search warrants but I do not consider it to have been inappropriate that these matters were not disclosed. As to concerns about the public manner of the execution of the search warrant – I have concluded that Snr Sgt Isles was not detained in an extremely public manner. It was in his own office at the Ayr Police Station that Sen Sgt Isles was detained and the warrant executed upon him. The search warrant was not executed at a time and manner where unnecessary embarrassment was occasioned to Senior Sergeant Isles. If anything, it appears that steps were taken to avoid causing unnecessary embarrassment to Sen Sgt Isles. Further, in my view it would not have been operationally appropriate for the CMC to delay executing the search warrants on Snr Sgt Isles. As to concerns about the return of property seized at the time of the execution of the warrants – the CMC obtained an Order in Relation to Thing Seized under the provisions of section 696 of the PPRA permitting the property to be retained. Therefore, notwithstanding the initial indications by CMC officers that the mobile telephone would be returned within three or four working days, in light of the order obtained by the CMC and Sen Sgt Isles’s written consent to the CMC keeping the property until the conclusion of any investigation or proceeding involving the property, it is difficult to conclude that the CMC’s retention of the telephone was inappropriate. The CMC’s retention of the mobile telephone for a further eight days after 29 April 2009 when Sen Sgt Isles was advised that the investigation regarding matters concerning him had been completed, may be regarded as inappropriate. I have concluded that the CMC’s investigation of Snr Sgt Isles was not conducted in a timely manner. The time it took to prepare the draft investigation report, make the determination as to whether there was evidence capable of supporting any action in respect of Snr Sgt Isles, and to advise him of that decision, was excessive. Steven Isles, in his letter to the Committee of 1 April 2009 advises that the continued and tardy investigation at the hands of the CMC has and continues to have a very marked impact on the health of my father, Michael Isles, mother, Fiona Isles, and also a number of other family members who were present at the time of executing the search warrant and the like. It is not surprising that an unduly protracted investigation of allegations as serious as these would have such an effect. Mr O’Gorman’s letter refers to previous complaints concerning the time taken over such investigations involving serving police officers. The CMC is well aware of such criticisms in the past and should have made a greater effort to complete this investigation within a reasonable time frame. However it should be noted that I have no adverse comments in terms of the quality of the investigation itself it was appropriately thorough and professionally carried out with suitable recognition of the seriousness of the allegations against Sen Sgt Isles and the QPS more generally. The son of a missing police officer has launched a petition calling for the resignation of Queensland’s police commissioner Bob Atkinson. Senior Sergeant Mick Isles has not been seen since September when he went missing from Ayr in north Queensland. Steven Isles believes his father was bullied by the Queensland Police Service and says an overhaul is needed. 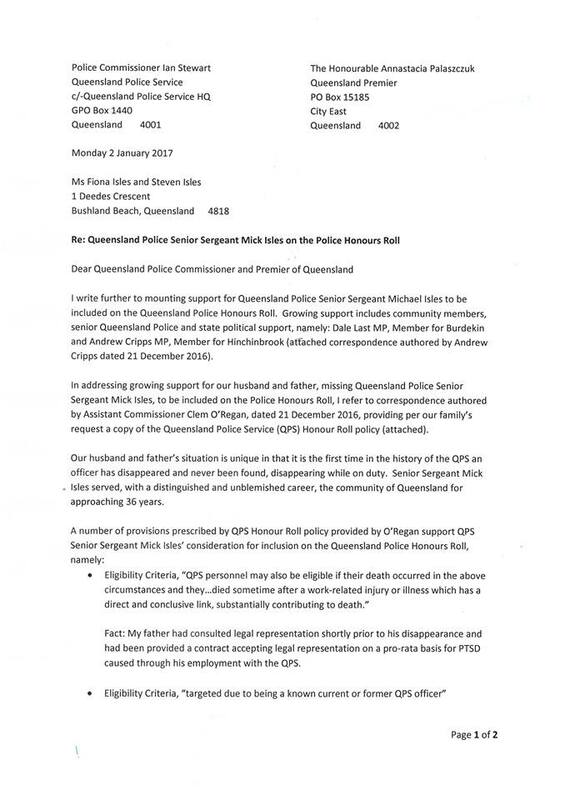 “I’m actually in the process of starting a 5,000 kilometre trip throughout Queensland, rallying for support to move a no-confidence motion in commissioner Atkinson’s continued service as the chief executive officer of the Queensland Police Service,” he said. The ABC has approached the Commissioner’s office for comment. The Police Union is not commenting. AFTER exhausting all conventional options, the family of Mick Isles has turned to an Aboriginal tracker and self-professed witchdoctor to find the missing Queensland police officer. Arnhem Land-based tracker and witchdoctor Victor Huddleston and his son Victor Nathaniel Huddleston have arrived in Queensland and tomorrow will begin searching bushland around Ravenswood, where Senior Sergeant Isles‘ abandoned car was found in late September. An exhaustive search involving police, army and SES personnel was launched shortly after Snr Sgt Isles‘ disappearance on September 23 but failed to find any trace of the missing policeman. However, Mr Huddleston believes he and his son will find Snr Sgt Isles within two or three days, even though any footprints left by him a month ago will have disappeared. “I will know where he is because I will see his spirit,” Mr Huddleston told AAP. Mr Huddleston has been involved in a number of searches in the Northern Territory and says he has never failed to find the person he’s looking for. “When I get close to the place I will see the clear picture,”he said. Senior Sergeant Isles‘ son Steven travelled to Mr Huddleston’s community last week to seek his help after learning of his reputation through a police contact in the Northern Territory. He said having spent time with Mr Huddleston in his community at Ngukurr in Arnhem Land, he was confident in the witchdoctor’s abilities. “We have no expectations, but we are approaching with open arms,” he said. THE search for a missing senior police officer in north Queensland has moved into a scaled down third phase, with police to visit property owners in the Ravenswood area. Senior Sergeant Mick Isles, 58, who is stationed at Ayr in north Queensland, was last seen leaving his home in an unmarked police car at 7.30am (AEST) on September 23. The car was found near Ravenswood several days later, but an extensive air and ground search, which included 45 Australian Defence Force Personnel, has not been able to locate him in the past 12 days. A police media spokeswoman said, contrary to some media reports, police were not suspending their search but instead were focusing their attention on property owners. “Police will visit all neighbouring stations in the area, providing property owners and workers with pictures of Sen Sgt Isles and checking all water holes and water courses for signs of unexplained human activity,” the spokeswoman said. Yesterday, police said temperatures in excess of 30 degrees Celsius in rocky terrain with lots of steep inclines and gorges had left many searchers exhausted and had had an effect on numbers. The matter is now in the hands of the state coroner. Acting Commissioner Ian Stewart said the state coroner had become involved along with the northern coroner and they were now directing the investigation. Sen Sgt Isles‘ son Steven Isles, a police officer in the Northern Territory, said the family was deeply worried about his father’s welfare. “Our family is obviously quite distraught. We wake up every morning hoping we are going to hear some good news,” Mr Isles said. He said his father suffered from severe depression brought on by a delay in the joint Crime and Misconduct Commission (CMC) and police investigation into allegations made against him. The CMC investigated Sen Sgt Isles over allegations of receiving payments for improperly issuing driver’s licences and money laundering. The investigation exonerated Sen Sgt Isles on September 18, but took more than a year. “The delay in the joint CMC and police investigation certainly impacted on my father,” Mr Isles said. A Facebook site called Help Find Mick Isles, set up by the family, has attracted the support of more than 4700 well wishers. The investigation into the disappearance of a North Queensland policeman is now in the hands of the state coroner. Senior Sergeant Mick Isles, 58, left his home at Ayr, south of Townsville, to attend a police training session on September 23. His unmarked police car was found near Ravenswood several days later, but an extensive air and ground search has not been able to locate him. Police and SES volunteers will continue scouring the area today and will review search efforts this afternoon. Acting Commissioner Ian Stewart says police are no longer in charge. “The state coroner has become involved [with] the northern coroner and they are now directing the investigation,” Acting Commissioner Stewart said. The Crime and Misconduct Commission (CMC) says it has investigated allegations against the missing officer but they could not be substantiated. Police Minister Neil Roberts says he will not comment on reports the officer’s family is pursuing legal action after he was cleared by the CMC. “I can understand the family is going through a very traumatic time at the moment and I don’t want to make any comment on any proposed legal action or not,” Mr Roberts said. “In the end, individuals have a right to pursue whatever action they feel is appropriate. THE family of missing Ayr police officer Senior Sergeant Mick Isles has set up a trust fund to finance a legal fight. Sen-Sgt Isles disappeared on Wednesday last week, just two days after he returned to work following an exhausting nine month Crime and Misconduct Commission investigation from which he was cleared. The move comes as police phase out the search and rescue component of their response and instead launch a missing person investigation. Police have also confirmed they are investigating why Sen-Sgt Isles disappearance wasn’t reported when he failed to turn up at a planned training session in Townsville. Son Steve Isles would not elaborate on the exact nature of the legal action, but said his father was suffering depression at the time of his disappearance as a result of the events which had played out over the past year. ”It’s a trust fund which has been established for legal action which is pending,” he said. ”It’s certainly a fund which has been established in the pursuit of justice which the family feels will prevail no matter what the outcome of the search. ”The fund has been established due to the overwhelming requests from the public. Mr Isles said the family was grateful for the support of those conducting the search, including the police service. ”They are our best hope of getting him home safe at the moment,” Mr Isles said. However, he urged all organisations to review their procedures when dealing with an employee suffering from a mental illness. Sen-Sgt Isles left Ayr to attend a training course in Townsville on the Wednesday morning, but it wasn’t until 7pm that evening that his wife, Fiona, raised the alarm despite his non-attendance at the course. ”It is certainly alarming when the police make arrangements for that person to attend training and no one follows up on seeing where that person is or touching base to make sure if they are okay,” Mr Isles said. Northern Police Region operations co-ordinator Chief Superintendent Mike Keating said the circumstances surrounding Sen-Sgt Isles‘ disappearance would be fully investigated. Supt Keating said police were still hoping for the safe return of their colleague but were preparing for the potential of a coronial investigation. An extra 40 people will be tasked to the search and rescue efforts at Ravenswood today where the car driven by Sen-Sgt Isle’s was found abandoned on Monday. The 100-strong team will search the less likely areas in the 63km square radius from where the vehicle was found but in the absence of further evidence, efforts will be scaled back in that particular area. Two weeks before his father vanished, Steven Isles travelled from his home in the Northern Territory to the family home in Ayr. A fellow policeman, Steven knew his dad, Senior Sergeant Mick Isles, was suffering. 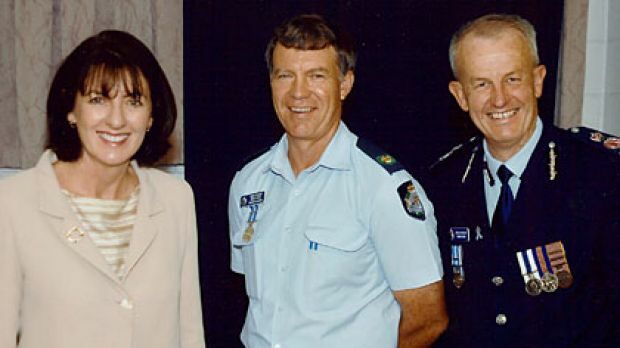 Senior Sergeant Mick Isles (centre) with former state Police Minister Judy Spence and Queensland Police Commissioner Bob Atkinson. For 13 long months Senior Sergeant Isles, a seasoned general duties officer and pillar of the local north Queensland community, had carried a terrible shame. Mistakenly caught up in a corruption inquiry linked to drug trafficking and the fraudulent issue of driver’s licenses, he had not recovered from the humiliation of being arrested in front of members of his local Lions Club. A 35-year veteran of the force, he had been planting trees in July last year when senior police acting on behalf of the Crime and Misconduct Commission detained him for questioning. His house and his workplace were also raided. He was officially cleared on September 18, but family say few in the town or the confines of Ayr police station ever believed he had done anything wrong in the first place. And yet the damage was done, Steven Isles said yesterday, eight days after Senior Sergeant Isles, 58, removed his uniform, dumped his police car and took off into rugged bush 80 kilometres from home. “Over the past 10 months I’ve watched him age in the face five years. He became reclusive, he was too embarrassed to show his face in public,” Steven Isles said. “My father is a very proud, very strong, very humble man. He did not ever want to be the centre of attention. “It was like taking a senior public servant or a politician and arresting them at a press conference. Everyone is entitled to a presumption of innocence. The family, represented by outspoken civil libertarian Terry O’Gorman, is taking legal action against the CMC and has set up a fighting trust – The Justice Fund. Wife Fiona, daughters Lisa, 31, Nicole, 24, and son Steven, 29, have traversed the state with Senior Sergeant Isles during his lengthy police career serving in Brisbane, the Darling Downs, Cloncurry, Bowen and the Gulf of Carpentaria. He had returned to work after a period of stress leave just two days before he vanished. On September 23, as Sydney awoke to an eerie red sky and dust storms tracked north towards Brisbane, Senior Sergeant Isles pulled out of the driveway of his Young Street house about 7.30am in a silver police-issue Toyota Aurion sedan. Having just returned to the job, he was being retrained in defensive skills and had been due to attend a course at Townsville police station that morning. Instead, he drove 80 kilometres in the opposite direction, to the remote Hillsborough cattle station. His car was found abandoned – ignition keys on the passenger side floor – about half a kilometre off a dirt track six days later. His uniform had been removed, leaving him in just a singlet and boots, and investigators say he was carrying no mobile phone. “Certainly there were no signs that something like this was about to unfold,” Steven Isles said. “He had had a difficult time but he was not someone who would ask for help. Police on Wednesday called in the army and State Emergency Service to help scour 63 square kilometres of bushland near to where Senior Sergeant Isles‘ car was found. That is not something Steven Isles or his family is ready to consider. A Facebook page set up by Nicole Isles this week imploring people to “please keep your eyes peeled for my dad” has attracted 3200 members and growing. “We are absolutely lost but we will not give up hope. We are doing everything we can,” Steven Isles said. “Members of the community have come to us with dreams they’ve had. We’ve consulted a clairvoyant. We are open to absolutely anything at this point, anything that will lead us to our father. “He could be disoriented, he’s probably hungry and sunburnt… [but]I would certainly hope he might feel compelled to find someone close by to bring him to a place of safety. Senior Sergeant Isles is about 180 centimetres tall, of a medium build, with brown wavy hair and hazel eyes. Anyone with information is asked to contact Crime Stoppers on 1800 333 000. If you or someone you know needs help with depression, contact SANE Australia on 1800 187 263. A MAN matching the description of a missing Queensland policeman has been sighted near Townsville. Police have appealed for more information after members of the public reported seeing a man dressed in civilian clothing and matching the description of Senior Sergeant Mick Isles walking along the highway near Toonpan, about 30km south of Townsville. Grave fears have been held for Snr Sgt Isles since he went missing last Wednesday. Snr Sgt Isles is stationed at Ayr, in north Queensland, and was last seen leaving his home in an unmarked police car at 7.30am on Wednesday. Officers located the silver Toyota Aurion sedan at a remote property near Ravenswood. The man sighted on the highway is described as caucasian in appearance, aged in his late 50s, approximately 178cm tall, with greying hair. He was wearing a short sleeved checked shirt, grey dress shorts with a thin black belt, white socks and black shoes. He was also carrying a small carry bag. Police have asked members of the public to remain vigilant for any sightings of any person along the Flinders Highway and in the Toonpan area that may fit the description of Snr Sgt Isles. It wouldn’t surprise me in the least that when they find Isles, they will charge him with Illegal Use of a Motor Vehicle. POLICE have found a car believed to have been driven by a missing police officer. Grave fears are held for Senior Sergeant Mick Isles who has been missing since early Wednesday. A police spokesman said officers had located the silver Toyota Aurion sedan, with Queensland registration number 060KVD, at a remote property near Ravenswood. The owners of the property called police this morning after locating the vehicle. Police have arrived at the scene, and an aerial and ground search is underway. There has been similar investigations run here in NSW where a bodgey complaint gets lodged for what ever reason and then warrants are obtained to dig up something and then when nothing is found they go down the managerial path and find that the person who was alleged with a serious criminal offence is now only guilty of not signing a diary. It stinks and has been going on for years, destroying careers of very highly regarded officers. Most of all as in this case the family also get hurt, but I am sure, like here in NSW the QLP Senior Executive have not given a rats about the wife and kids. Royds does this story sound familiar with one of your close mates???? I hope an pray that the good Sergeant has just decided to take some time out as he has a family who will be left in pain forever should something terrible happen. What you say is so true but to not invite the Senior Sergeant to the opening of his own Police Station is about as low as you can go. QPS management should hang their head in shame as something like this is all it takes to tip someone over the edge and destroy a long career and a family. Police sources said Sen-Sgt Isles left a note in a downstairs safe thanking his wife and their three children for their support and for standing by him. LATEST: THE son of Burdekin police officer Senior Sergeant Mick Isles has delivered a tearful plea for information about his missing father. Police hold grave fears for the safety of 58-year-old Sen-Sgt Isles after he disappeared two days ago. The former officer-in-charge of Ayr Police Station was recently cleared following a Crime and Misconduct Commission investigation. He was last seen leaving his Graham St home about 7.30am Wednesday. Son Steve Isles, a police officer in the North Territory, choked back tears as he spoke to the media in Ayr this afternoon. He said he had spent the past fortnight with his parents in Ayr to help his father cope with depression. Police Commissioner Bob Atkinson travelled to Ayr today to support Sen-Sgt Isles‘ family, fellow police officers and staff. Sen-Sgt Isles was last seen driving a police service vehicle, an unmarked 2009 model silver Toyota Aurion sedan, with Queensland registration number 060 KVD (pictured below). He is of caucasian appearance, about 180cm tall, with a thin build, brown hair and hazel eyes. Police do not believe Sen-Sgt Isles is a danger to the public but urge against approaching the vehicle. Anyone who may have seen the vehicle or has any information relating to Snr-Sgt Isles location should contact Townsville Police on 4759 9777 or Crime Stoppers on 1800 333 000. A senior sergeant who vanished in north Queensland two days ago had only returned to work this week, having taken stress-related leave during a Crime and Misconduct Commission investigation. Senior Sergeant Mick Isles, who is based in Ayr, near Townsville, was last seen driving away from his home in a police service vehicle on Wednesday morning. He was reported missing the same day. His disappearance comes two months after the CMC cleared him of allegations he received payments for drivers’ licences improperly issued at the Ayr police station. brisbanetimes.com.au understands Senior Sergeant Isles had just returned to work on Monday. It is believed he signed out the police car on Wednesday morning to go to training in Townsville. A police statement said the force held “grave concerns for his welfare”. “We do not believe Senior Sergeant Isles is a danger to the public; however, we urge the public to not approach the vehicle, but to contact police immediately if they see the vehicle, or have any information relating to Senior Sergeant Isles‘ location,” the police statement said. Senior Sergeant Isles has been a police officer for 35 years, having served as officer-in-charge of various stations including at Ayr, according to a Townsville Bulletin report. He has previously won a Queensland Police Service Lantern Award for his interactions with the youth population in Cloncurry. Queensland Police Union president Ian Leavers described the officer as well respected. “He is a very highly regarded officer,” he said through a spokesman. People are urged to be on the lookout for an unmarked 2009 silver Toyota Aurion sedan with ( Qld ) registration plate number 060KVD. Senior Sergeant Isles is about 180cm tall, of a medium build, with brown hair, hazel eyes and a Caucasian appearance. I would just like to thank the QPS and the CMC for their unprofessional, victimising, deplorable, and degrading treatment of my husband, myself and my family. With only two years to go in the service, Mick held the QPS in high esteem for the past 35 years, but you have successfully changed all of that. Thank you for wrecking our lives. I take heart in `What goes round, comes round’. We are so very fortunate to have had the most remarkable PUBLIC support. Now I question the usefulness and effectiveness of (1) the hierarchy of the QPS and (2) the integrity of our so called watch dog, the CMC. This is contrived rubbish – whose ego was at stake here? I worked with this officer in many community matters and have not found anyone more honest or dedicated to his job and to improving the lot for Qld. I am disgusted. I have lost faith in the Qld police, who have barely considered this man’s years of exemplary service and the CMC who have run with gossip to enact such dire consequences. Shame on you all. …and you sit in the seats of justice! Senior-Sergeant Mick Isles has been cleared by the Crime and Misconduct Commission (CMC), however the fight to clear his name has just begun. For nine gruelling months, Sen-Sgt Isles has been the subject of a CMC investigation into the suspected improper use of a number of drivers’ licences. The long-serving officer, who is currently on voluntary sick leave, was never officially stood down from policing duties. The CMC yesterday confirmed its investigation was unable to substantiate an allegation that Sen-Sgt Isles had corruptly received payments for drivers’ licences improperly issued at Ayr Police Station. However, the authority said it had referred evidence of `serious maladministration of the Ayr police station, including issues of drivers’ licences’ to the Queensland Police Service (QPS) for further investigation. 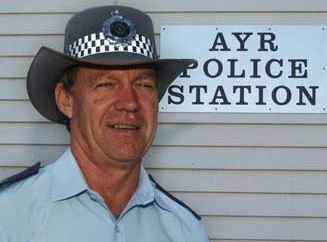 CMC spokeswoman Karen Crook said Sen-Sgt Isles was advised of the outcome of its investigation last week, however the Lantern Award-winning police officer only received a letter from the public watchdog on Wednesday “ the same day Ayr Police Station was officially opened by Police Minister Neil Roberts and Deputy Commissioner Kathy Rynders. Sen-Sgt Isles had not been invited to the ceremony. Brisbane-based solicitor and Australian Council for Civil Liberties president Terry O’Gorman is acting on behalf of the Isles family to make an official complaint about Sen-Sgt Isles‘ treatment through Queensland’s Parliamentary Crime and Misconduct Committee (PCMC). Mr O’Gorman told the Townsville Bulletin he was prepared to take the matter even further, if needed. He said it appeared an unjustified search warrant had been taken out against Sen-Sgt Isles. “It was carelessly taken out. In any event, on the face of it, as it appears to us, it was unjustified and we want the PCMC to inquire into the circumstances that led to this search warrant being taken out,” Mr O’Gorman said. Sen-Sgt Isles was not able to comment yesterday due to legal issues. However his son Steve Isles, who serves as a police officer in the Northern Territory, said the manner in which his father had been treated was `deplorable’. “As far as the investigation’s concerned, it’s good to finally see some justice in bureaucracy,” Mr Isles said. Mr O’Gorman said the CMC needed to answer why it took it so long to complete its investigation. The watchdog has blamed the delay on the fact Sen-Sgt Isles was on extended sick leave and he had refused to communicate with them – an allegation strongly denied by the Isles family. “If you are a police officer and your life is effectively put on hold, it’s just unacceptable. On the face of it, this clearance could have been given five, six or seven months ago,” Mr O’Gorman said. QPS Deputy Commissioner Rynders this week said Sen-Sgt Isles had not been invited to the official opening of his station due to a `miscommunication’ between him and the regional office. Mr O’Gorman said they must have known his client had been cleared by the CMC well before the station was opened, as the letter sent to Sen-Sgt Isles was dated April 29. In a short statement from QPS yesterday, a spokeswoman said police would proceed with issues raised by the CMC. Mr O’Gorman said it added insult to injury for Sen-Sgt Isles. Sen-Sgt Isles, who has been a police officer for 35 years, was nominated for the Townsville Bulletin’s North Queensland Police Officer of the Year award last year. Sen-Sgt Isles has been in charge of several police stations since 1985. He was also awarded a Queensland Police Service Lantern Award, for youth action commitment in Cloncurry.